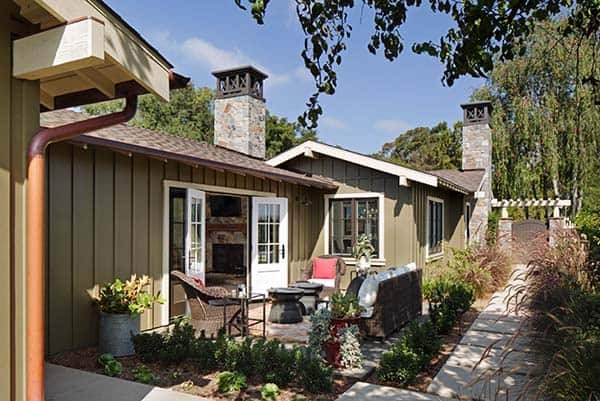 This lovely ranch style coastal home features a causal living environment, with interiors designed by Anne Sneed Architectural Interiors in San Diego, California. 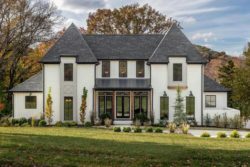 The renovation began with a couple who had lived in their home for over twelve years but had come to a point where they found their lifestyle had outgrown their home. Having purchased their four bedroom (two of which are used as office spaces) home after they were married back in 2000, the couple did not really want to leave the only place they had called home. It was close to wonderful shops, the beach and a horse property where one of the owners rides show jumpers. 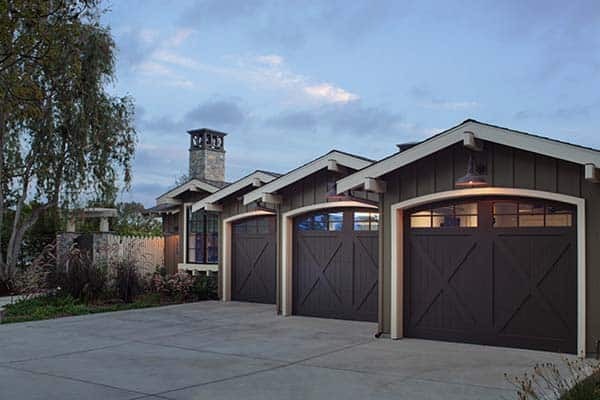 The homeowners also liked the way the home was laid out on a single level with an indoor-outdoor lifestyle, lending itself perfectly to the California coastal vibe. The couple both worked from home and found themselves needing more space to move around. 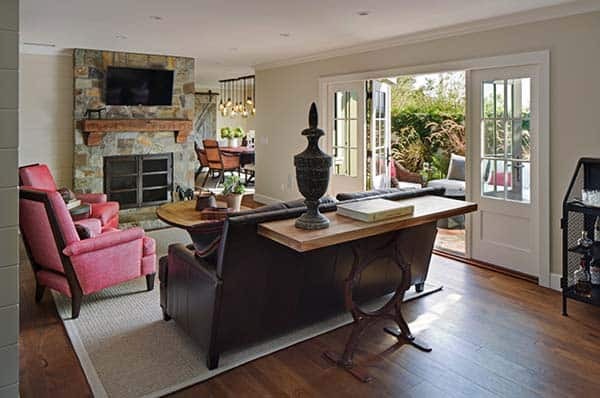 The home renovation encompassed an increase from 2,500 square feet to 3,250 square feet, with the addition of a dining room, laundry room, library, powder bath and a third garage, while still maintaining a casual style ranch atmosphere. 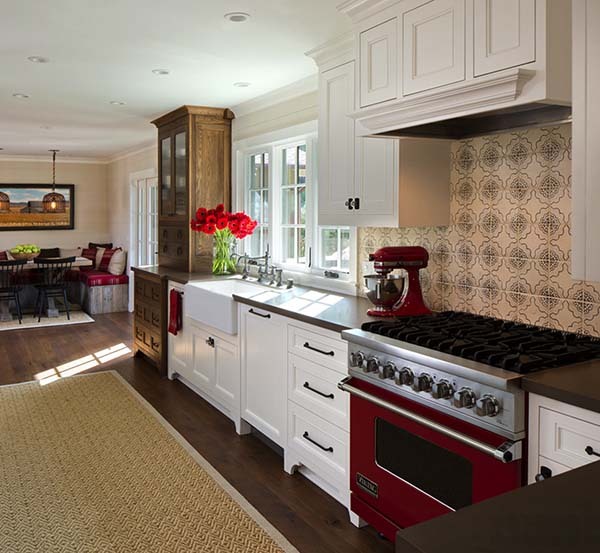 The designers freshened the home by making it inviting, timeless and warm, making it harmonious throughout the spaces. The home also caters to the couple’s two dogs, so everything had to be animal friendly, with monogrammed beds featured in just about every room. 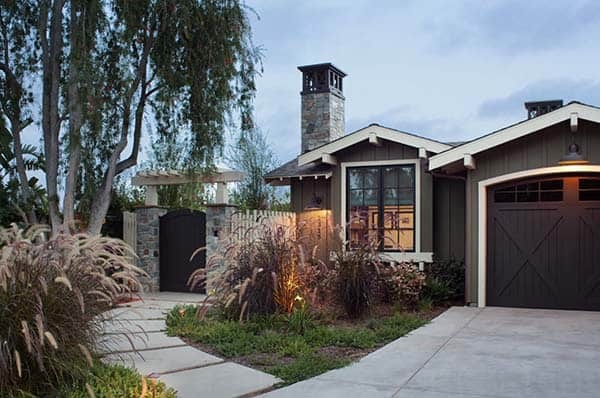 Through the living room doors there is a cozy outdoor living room surrounded by lush landscaping. 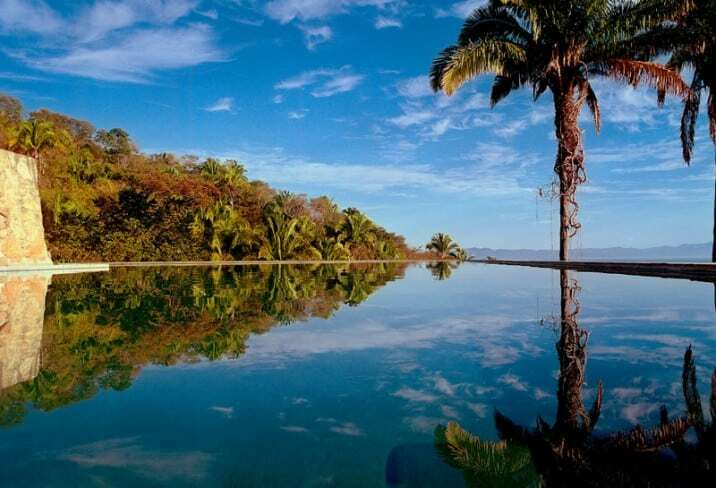 This is a wonderful spot to sit with guests or to relax after work. 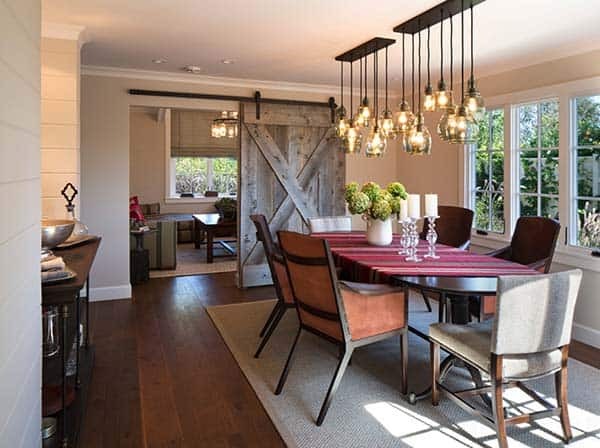 The dining room is nestled between the living room and the new library, to which a rustic barn door separates the space. 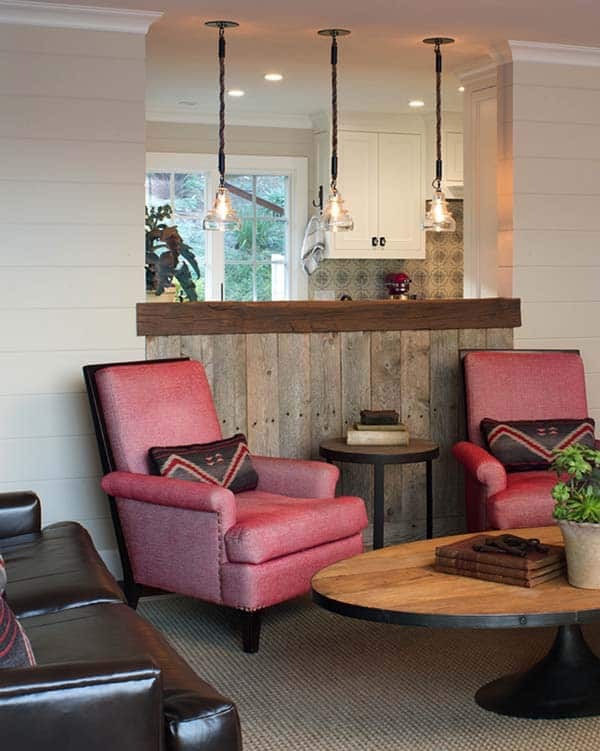 The wall on the left side of the room is clad in pine shiplap and painted white. The lighting above the dining table showcases two fixtures instead of one (which is typically installed in the center of the room). This helps to offer better lighting options. A great tip is to add a dimmer switch to your dining room to help set the mood. FYI: The light fixtures are from Pottery Barn. Notice how there are two? The designer has stated that most people only place one light fixture in the center, when sometimes your dining room may need more light—therefore, add two! The library was designed as more of a man cave, a great space to watch television. 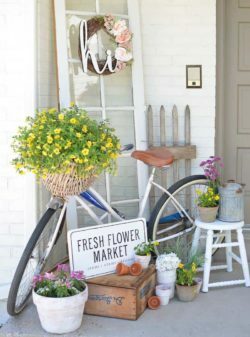 It also showcases family photos and sentimental items on the shelves, a great space for reflecting the homeowners personality and character. 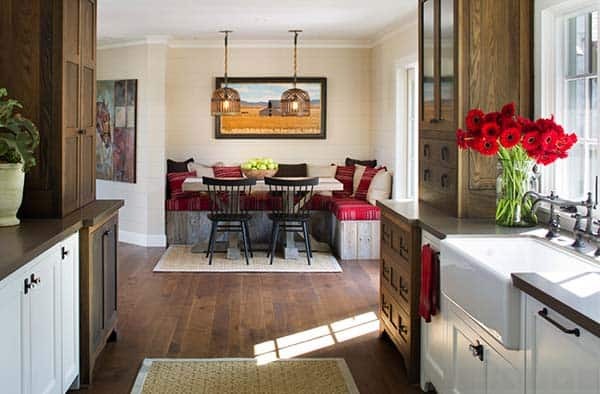 The breakfast nook takes on a casual feel with a reclaimed wood bench, cushions and pillows covered in red and white fabrics, wooden farmhouse style chairs and the cage-like pendant lights hanging over the table. 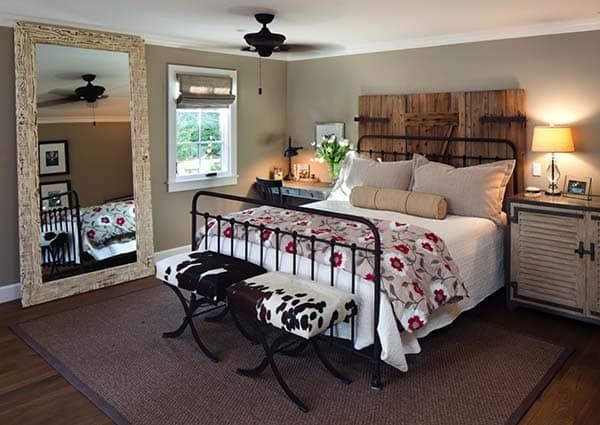 The master bedroom retreat features barn doors as an accent feature behind the headboard. The coverlet features some red accents, which is a hue that has been seen as a recurrent theme throughout the interiors, the homeowners favorite color. A mirror with reclaimed wood framing makes the room feel more spacious. The designer used a little ingenuity in this space by using a desk on the left side of the bed as a nightstand. This way the owner can do some extra work before going to sleep and use the space as a charging station for cell phones. 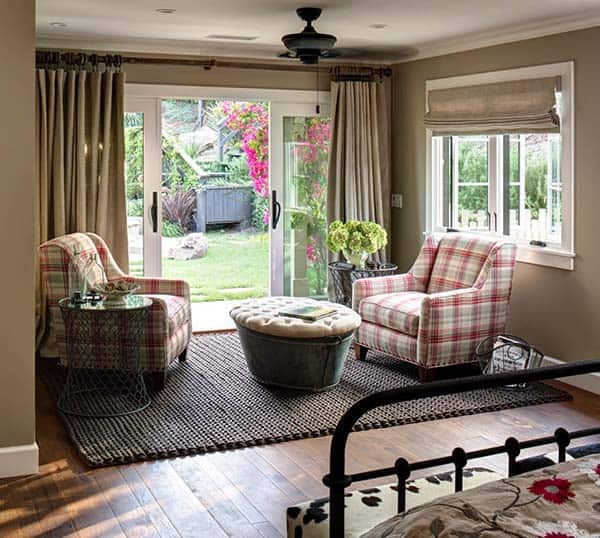 The bedroom features french doors leading to the backyard, continuing the indoor-outdoor lifestyle. A cozy little seating nook for relaxation and reading features an ottoman that was re-purposed from a galvanized bucket and finished with a tufted fabric cushion. 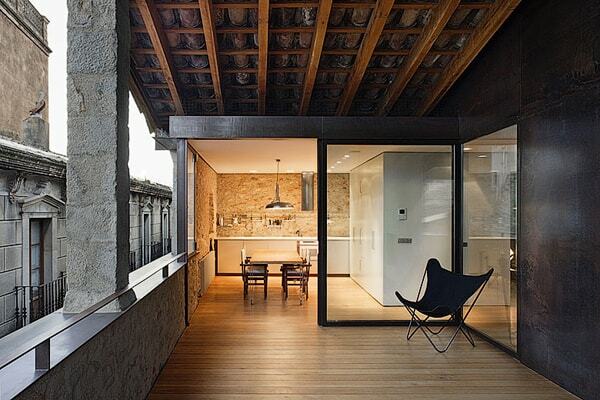 Lots of light is brought into the space though windows, and beautiful drapery fabrics allows for privacy. Update: We have had a lot of questions on this bathroom, so this is an addition to this article to give full details on this amazing bathroom!! Here is the info: The vanity is custom designed, 7′-6″ in length. The material is white oak treated with Rudio Monocoat Fumed, then a coat of Rubio Monocoat Pure Oil. For the hardware, the designer suggests looking at Rocky Mountain Hardware or Scuab. 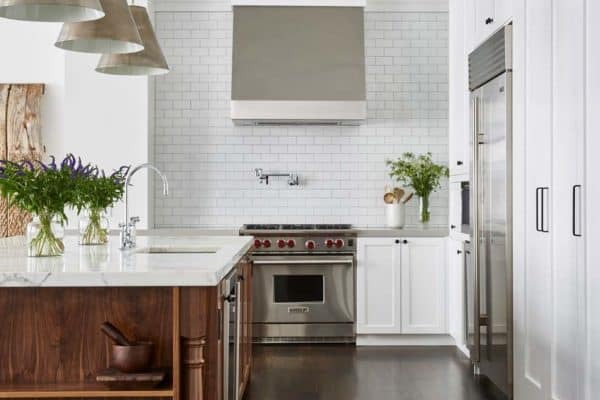 The countertop is Calcutta marble, while the backsplash is the same material in 2×4 subway tiles. The faucets are from Rohl. The beautiful pendant lights are the Maria Pendant from Cisco Brothers. For a similar, more budget-friendly option, try the Braelyn Pendant from Lighting Connection. 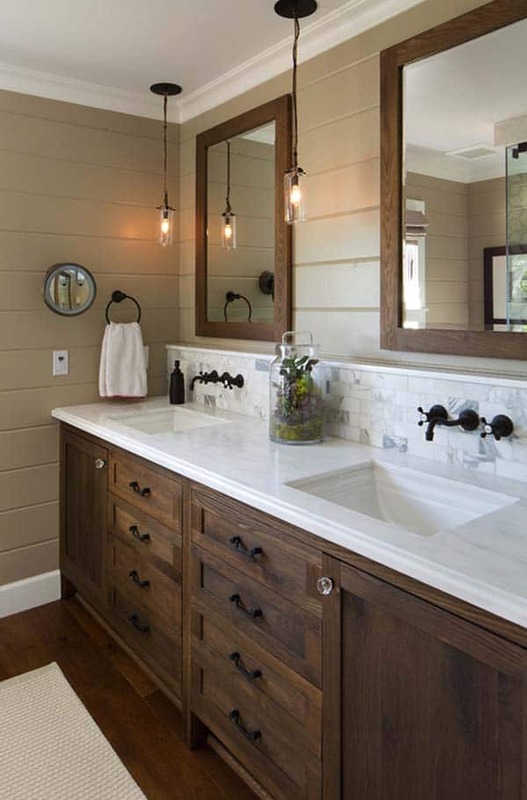 The mirrors were also custom designed and made to match with the vanity, using the same stain application. 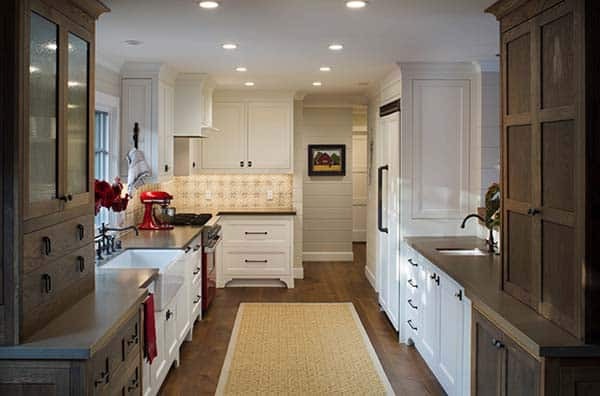 The shiplap walls were painted in Dunn Edwards Pigeon Gray. 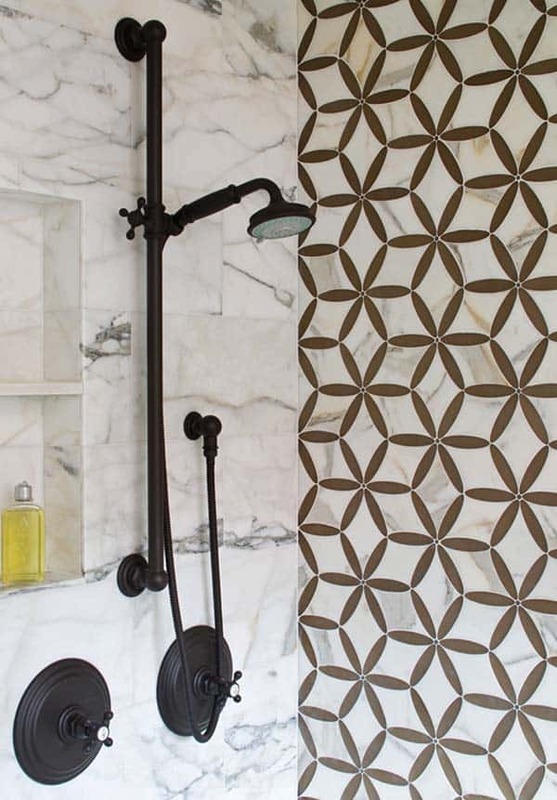 Above: The shower features a water-jet glass and stone mosaic from the Nadeau GBI collection. The faucets are from Rohl. 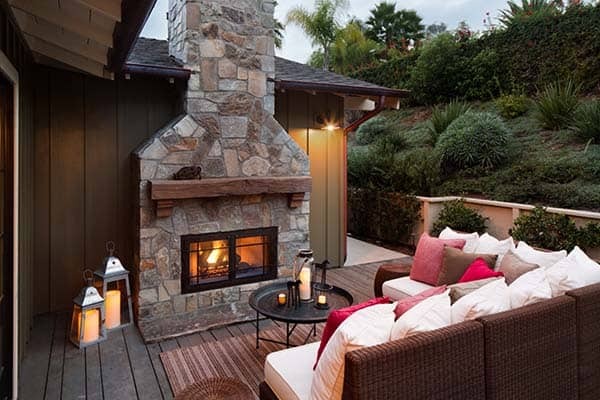 A second outdoor space features a cozy sectional with plush toss pillows set around a stone fireplace. 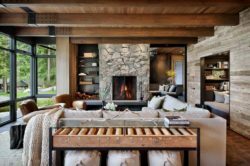 The fireplace shares the same chimney as the library with a mantel comprised of reclaimed wood beams. I like the color of the bathroom walls. Would like to know the name of it. Hi Kathy, I have updated the article to include more information on the bathroom. But I would also like to personally comment to you with the info you requested. The shiplap walls were painted in Dunn Edwards Pigeon Gray. Hope this helps… so sorry for the delayed response! Hi Kathy, the wall paint color is Dunn Edwards Pigeon Gray. The walls are a tongue and groove paneling with a V-groove. Do you have any information on that bathroom vanity? Hi Carlie, the bathroom vanity is custom designed. It is white oak treated with Rudio Monocoat Fumed, then a coat of Rubio Monocoat Pure Oil. **You can hire a contractor or a custom cabinet maker in your area to design this for you. 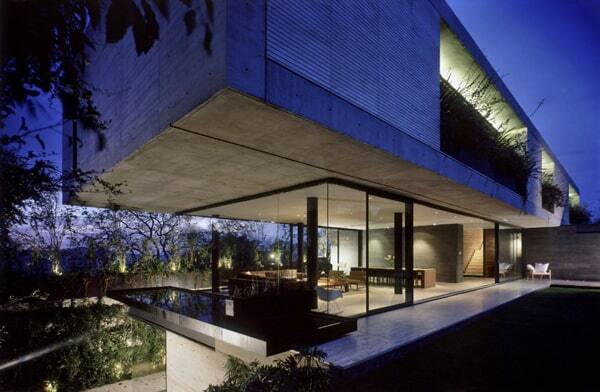 Just show them the picture and they can copy and retrofit it to your space. FYI: The countertop is Calacatta marble and the backsplash is 2×4 marble. The faucets are from Rohl. Hi Carlie, the bathroom vanity is white oak treated with Rubio Monocoat Fumed, then a coat of Rubio Monocoat Pure Oil. The countertop features Calacatta marble, custom fabricated by the designer. 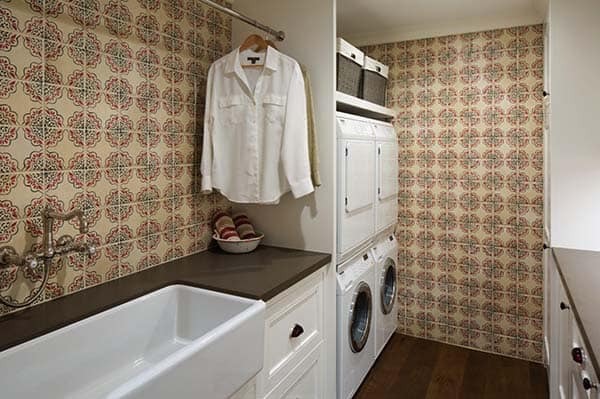 You could hire a custom cabinet designer in your area to design your bathroom to look identical to this image and have a countertop company (any tile company) install the countertops with the integral sink. The faucet is Rohl. Would also like to know where to purchase the bathroom vanity. Hi Tracy, the bathroom vanity is custom designed. It is white oak treated with Rudio Monocoat Fumed, then a coat of Rubio Monocoat Pure Oil. **You can hire a contractor or a custom cabinet maker in your area to design this for you. 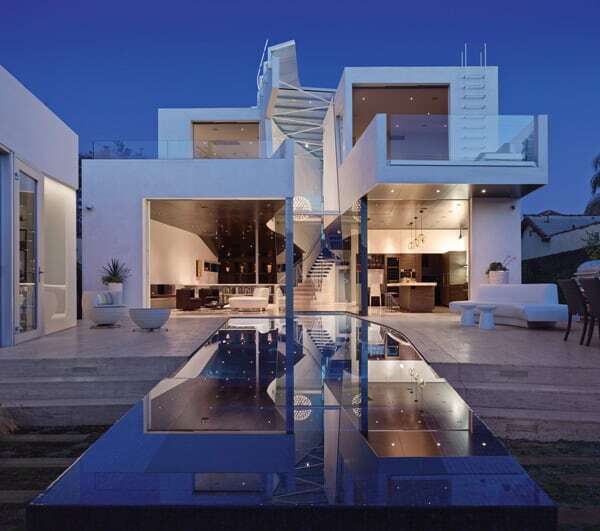 Just show them the picture and they can copy and retrofit it to your space. FYI: The countertop is Calacatta marble and the backsplash is 2×4 marble. The faucets are from Rohl. Third times the charm!?! I am about to remodel my master bath. I’m in love with that vanity, please, please, please share where it’s from! What size are the sinks and who is the manufacturer? Thanks! What size the are sinks (width, height & depth) and who is the manufacturer? Hi Ari, the bathroom vanity is white oak treated with Rubio Monocoat Fumed, then a coat of Rubio Monocoat Pure Oil. The vanity is about 7′-6″ in length. The countertop features Calacatta marble, custom fabricated by the designer. The backsplash is a Calcutta Marble brick tile. You could hire a custom cabinet designer in your area to design your bathroom to look identical to this image and have a countertop company (any tile company) install the countertops with the integral sink. Hi, Where is the bathroom runner from? Hi Alexis, the floors feature custom hickory with a Rubio Monotone finish. The runner is from Ralph Lauren. where is the bathroom vanity from?? Hi Erin, the bathroom vanity is white oak treated with Rubio Monocoat Fumed, then a coat of Rubio Monocoat Pure Oil. The countertop features Calacatta marble, custom fabricated by the designer. You could hire a custom cabinet designer in your area to design your bathroom to look identical to this image and have a countertop company (any tile company) install the countertops with the integral sink. Would loved to see the rest of the bathroom. Looking for ideas on remolding our shower along with the vanity. I would love to know where the bedding came from.